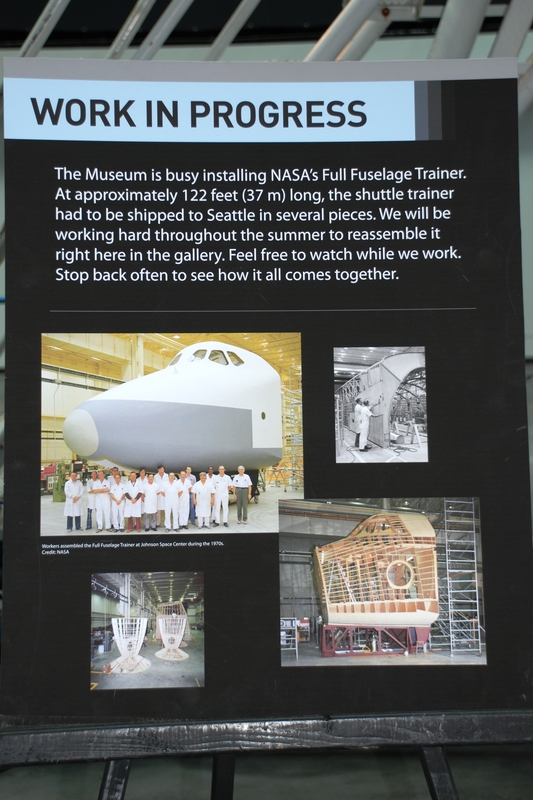 The above photo explains the timing of our visit to the Museum of Flight in Seattle: we wanted to see the package NASA dropped at Boeing Field a few weeks ago. 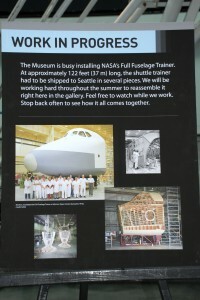 While I’m sure the Board and employees of the Museum of Flight were disappointed by NASA’s decision to send the retired Shuttle fleet elsewhere, they must have been intrigued by the consolation prize, the Full Fuselage Trainer (FFT). 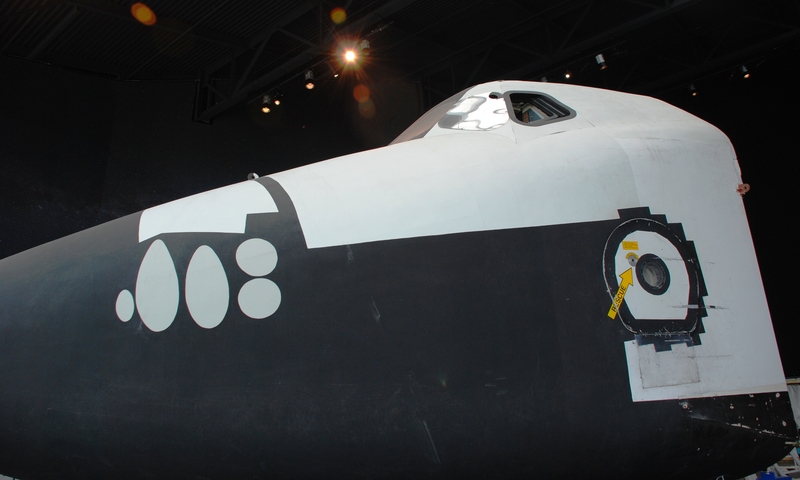 A full-scale mock up of a Space Shuttle, the FFT served as a training ground for every Shuttle crew, allowing the astronauts to practice emergency egress and EVA procedures. The FFT has been arriving piece by piece (the aft section of the payload bay arrived earlier this week) and instead of waiting for the entire “spacecraft” to show up, the curators have been putting the pieces on display as they arrive. I’m not sure how I would feel about it as a curator. Letting an exhibit go up before everything was in place would probably make me anxious. 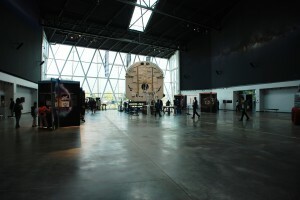 And the Charles Simonyi Space Gallery, the new home of the FFT, has an incomplete, cavernous feel to it at the moment as it sits more than half empty. On the other hand, anticipation is building and has been since the first shipment arrived via the Super Guppy. It’s a bold and quite possibly brilliant curatorial decision, inviting the public to witness the building process. Each Super Guppy touchdown is an opportunity for another press release; each component installed is a reason for visitors to return to the gallery. By the exhibit is complete, the community will be completely invested in the project and hopefully the financially longevity of the museum. At present, though, the gallery is mostly empty, with a few smaller (intriguing!) exhibits holding down its edges. As in the Great Gallery, the wall of glazing at the front of the building creates a difficult lighting situation for photography and I spent a lot of time trying to find a setting that compensate for the glare without erasing the details of the FFT. As you can see from the photo at the top of this post, the nose of the FFT consists massive wooden shell painted with matte black. The auto focus on my camera refused to cooperate for close up photos and even when I pulled back, the (lack of ) contrast between the black wood and the black walls of the gallery forced me rely on manual focus. I’ve uploaded a few more photos to my flickr site. I’m looking forward to going back and documenting the completed trainer one day soon.